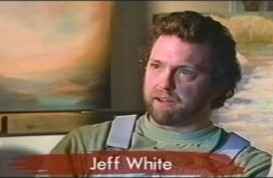 Jeff White is a fine artist from Portland, Oregon, specializing in oil and pastel paintings. Known for his dramatic and colorful skyscapes and depictions of the beautiful Northwest landscapes, his art is collected around the world by museums, corporations and private collectors, including Clint and Dina Eastwood, Schnitzer Steel, and Grammy-award winner Joanna Newsom. Jeff studied art at Art Center College of Design in Pasadena, California where he received a Bachelor’s degree in Fine Art. He also studied at Pacific Northwest College of Art in Portland, Oregon. He has been painting and exhibiting for over twenty years, finding his inspiration from the Columbia Gorge and the Oregon coastal regions, mountains and rivers. When not painting, Jeff enjoys cooking, fishing, traveling and spending time with his wife and five children. Within nature there are forceful, intelligent elements that coexist beside and in spite of humanity. They cannot be reasoned with or controlled and have always survived and outlived mankind. Mystically, they often mirror man's own walk through life. Throughout life's spiritual journey, we encounter rivers, valleys, shadows, daybreaks, storms and beautiful clearings. We face horizons that move us from a calm serenity through turbulent storms only to return back to a peaceful state with a deeper understanding of ourselves. My paintings reflect some of my most memorable and moving experiences with nature. I attempt to capture and convey a resonance of the external and internal forces one often experiences while viewing a dramatic sky against a beautiful landscape or a storm moving through a valley. My work represents a spiritual journey and the balance found in the harmonies I see between the environment and man as a voyager passing through time. Using oil and pastels, I focus on capturing the colors, shapes and moods of the land and the sky. I use thin glazes and layers of transparent pigments to emulate the atmospheric conditions that exist in the natural world.